Introduction Infection continues to be a real problem in orthopaedic practice. Infection is probably the first cause of failure of orthopaedic and trauma operation, it is behind prolonged suffering for our dear patients because of the morbidity and mortality. Although there have been significant reduction in infection due to better surgical techniques, improved operating room environment, more effective antibiotics and the wide spread use of prophylactic antibiotics, we all will face this bad omen in one of our patients at some time in our practice. Sadly, infection continues to happen despite our strenuous efforts to prevent it. Prolonged hospital stay to treat infection may expose the patients to resistant nosocomial pathogens. The incidence of infection varies considerably worldwide; I think the incidence in our locality is very high. The current use of ultra clean air, antibiotics, and exhaust ventilated suits during implantation of prostheses considerably reduced infection. Nevertheless, lack of agreement and controversies still exist regarding the benefit of these very strict infection prevention techniques. Infections are considered nosocomial if there is no evidence that the infection was present or incubating at the time of hospital admission. Infection is considered related to surgery if that occurs at the incision site within 30 days after surgery, if no implant is left in place or within one year if the implant is in place. Infection may occur at all anatomical levels, from the treatment point of view it is vital to precisely allocate the anatomical site of infection. Infection is usually diagnosed depending on clinical features which are to be confirmed by laboratory tests. The presence of pus does not always mean infection, because necrosis of malignant lesion may simulate purulent material. Frequently, patients who have prostheses may be readmitted to the hospital for medical care or other surgical procedures during that time, the bladder catheter, intravascular line, that involve contaminated areas of the body may increase the risk of nosocomial infection. A high risk of infection is present in collagen disease, malnutrition, steroid dependent and other immune suppression drugs, sicklers, hidden nidus of infection anywhere in the body and any operation that lasted longer than the anticipated surgical time. The presence of diabetes mellitus is a concern in patient for surgery. Diabetes impairs the immune response to infection; therefore, wound healing may be difficult in those patients. In acute infection the influence of diabetes is much than in chronic infection. Some patients may have more than one risk factor. MANAGEMENT OF COLORECTAL CANCER DURING PREGNANCY Majeed H Alwan MBChB, FRCSEd, FRACS, FACS, Gastrointestinal and General Surgeon, Tauranga Hospital, Tauranga, New Zealand. E-mail: majeedalwan@xtra.co.nz Abstract Although cancer in pregnancy is uncommon, several types of cancer were encountered. These include malignant melanoma, breast cancer, carcinoma of the cervix, bladder cancer, renal cancer, lymphomas, thyroid cancer, brain tumours, ovarian cancer, gastric and pancreatic cancer and colorectal cancer. Due to the uncommon incidence of the disease and therefore the limited experience coupled with the complexity of the situation which could affect the wellbeing of the foetus and mother, then the management of the pregnant woman with cancer might result in achieving less than the expected optimum. However, from the experience of single case reports and short reviews a reasonable management approach could be reached through multidisciplinary speciality collaboration. The author had encountered two pregnant women with colon cancer, both of them were symptomatic, and one of them had bowel obstruction. Their clinical presentation, diagnosis and management are described followed by a concise review of the literature. This study is designed to evaluate the parameters that indicate the quality of care in acute appendicitis. It is a prospective study in Basrah General Hospital. One hundred ten patients underwent appendectomy in the period between March and July 2010, were studied according to a data collection sheet. The mean duration of symptoms was 29.2 hours and 10% of patients visited the hospital twice. Decision to operate depending on clinical diagnosis alone done in 14.54% of patients while blood cell count was the most frequent investigation done in 78.18% of the patients. The mean waiting period was 6.6 hours. All patients received antibiotics postoperatively while antibiotic prophylaxis used in 74.5%. Rate of perforation of appendix was 12.7%. Histopathological examination of the removed appendix done in 7.27%. The mean hospital stay was 44.02 hours with 20% of patients developed post operative complications. Most of our patients were satisfied with hospital services, facilities and staff behavior. In conclusion, non-utilization of investigations in some patients, long waiting period, high complication rate and extended usage of antibiotics are aspects among others which need to deal with by conducting hospital audits. Splenectomy is performed rather frequently in Basrah city, it is indicated for various disorders including abdominal trauma, hematological disorders and others. This study aimed to analyze the experience in splenectomies performed in Basrah and outlining their different indications. 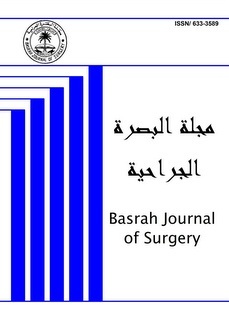 This is a combined prospective and retrospective study of patients who underwent splenectomy in the five major hospitals in Basrah over 3 years period (2008–2010). Patients underwent Splenectomy were 213, 54% underwent elective splenectomy while 46% underwent emergency splenectomy. 144 patients were males while 69 patients were females. The most common indications for splenectomy was trauma (44.6 %), B-thalassemia (18.3 %) and sickle B-thalassemia (17.3 %). In conclusion, the most common indication for splenectomy in Basrah was abdominal trauma followed by hematological diseases, most commonly B-thalassemia and sickle B-thalassemia. All patients underwent conventional open splenectomy, no one underwent minimally invasive approach. A double-blind study included 200 women attending labour ward. They were divided into two groups; group A (cases) received Buscopan 20mg I.V and group B (controls) received placebo intravenously. Assessment of cervical dilatation was carried out every hour post injection. The duration of the stages of labour, maternal and neonatal outcome was determined. The study revealed that cervical dilatation at 1 hour was significantly lesser in group A (6.8+1.8) cm compared to (7.6 + 2.1) cm in the control group (P<0.05). The duration of the first stage of labour was significantly longer among group A (4.1+1.8) hours as compared with the controls (3.4 + 1.6 hours) P<0.05. The frequency of caesarean section was significantly higher among group A (12 %) compared to controls (4%), P.value < 0.05. Fetal heart rate was significantly higher among group A (137.8+11.2 beat/min) compared to control (133.5+9.9 beat/min), P < 0.001. We conclude that the administration of Buscopan decelerate the cervical dilatation in the first stage of labour and causes prolongation in its duration. Also it is associated with small, but obvious fetal risk, and an increase in the rate of Caesarean section. Laparoscopic cholecystectomy first became popular during the late 1980s and now the procedure is consider the standard approach for symptomatic cholecystolithiasis. This study aimed to assess the value of sonography in predicting intraoperative difficulties for patients undergoing laparoscopic cholecystectomy and in identifying indicators for conversion to open cholecystectomy. This prospective clinical trial conducted in the Department of Surgery of Al-Sadir Teaching Hospital, Al-Mousawi private Hospital and Ibn Al-Baitar private Hospital in Basrah, Iraq, between January 2006 and October 2007. Abdominal sonography performed in 100 consecutive patients before laparoscopic cholecystectomy. The surgeon re-verified sonographic findings in the operating room. Out of 100 patients with cholecystolithiasis on sonography, we encountered straightforward laparoscopic cholecystectomy in 72 patients (72%), difficult laparoscopic cholecystectomy in 20 (20%) and the procedure was converted to open cholecystectomy in 8 patients (8%). Forty two patients had sonography revealing gallbladder wall thickness (>4 mm). The accuracy of sonography for cholecystolithiasis was 99%. In conclusion, an accurate preoperative diagnostic sonography is mandatory for planned laparoscopic gallbladder surgery to provide information for the selection of the most appropriate approach and to avoid intraoperative difficulties and surprises. On sonography, gallbladder wall thickening is the most sensitive indicator of technical difficulties during laparoscopic cholecystectomy, such difficulties may require conversion to laparotomy. Obstructive Jaundice is a common surgical problem presenting to hospitals as it resulted from many etiological factors like choledocholithiasis or periampullary tumors especially CA head of pancreas. According to the difference in these etiological factors and their progress, symptoms and signs vary in different patients. Diagnostic tools like US, CT scan, MRCP, ERCP and others vary in their ability in diagnosing the main etiology and the operative procedures also differs according to the etiologies, ranging from least invasive like ERCP to very sophisticated procedures like Whipple's procedure for CA head of pancreas. Many factors may affect the morbidity and mortality like the age of patients, presenting etiology and the presence of associated comorbid diseases. This study aimed to demonstrate the main etiological factors of obstructive jaundice in Basrah and the commonest presenting symptoms and signs. Also to study the most applicable investigations and compare their results according to their accuracy in diagnosing the etiology, and to study the most common surgical intervention applied to relieve the obstruction in obstructive jaundice and hospital morbidity and mortality. Both retrospective and prospective study was done in Basrah between January 2006 and December 2009, 243 patients with obstructive jaundice were included in this study from the main general hospitals and private hospitals in Basrah. Data were collected about the presenting clinical features, the diagnostic techniques, operative procedures and the causes of in hospital mortality and morbidity and were analyzed so that a complete picture of these details can be assessed for obstructive jaundice in Basrah. The study shows no significant difference between male and female in obstructive jaundice. The majority of cases found in the age group 50-59 years. Most common etiology was choledocholithiasis. The most frequent applied investigation was the liver function test which was done to all patients. Imaging techniques were applied variably with the US was the most applied while MRCP and ERCP were the least; however, the accuracy was higher with the latter two techniques. Intervention depends on the main etiology: for the choledocholithiasis, most common operation was CBD exploration, for CA head of pancreas the most common operation done was bypass procedure and for complicated hepato-biliary hydatid disease the CBD exploration with T-tube was the common. The post operative morbidity was 20.07% mostly due to respiratory complications, while mortality was 9.86 % mostly due to sepsis. In conclusion, the most common cause of obstructive jaundice in Basrah is choledocholithiasis and CA head of pancreas comes second. ERCP and MRCP are the least applied imaging techniques in diagnosis of obstructive jaundice. The threshold for their application was very high. The least applied intervention to treat obstructive jaundice was the therapeutic ERCP, while the most common was open surgical procedures. Fifty patients with unstable pelvic fracture were subjected to internal fixation through anterior approach by small fragment biosynthesis over sixteen year of experience. Their age, range between 15–45 years. Forty patients were males and ten patient females. Thirty patients with type B rotationally unstable fracture pelvis, 15 patients with type C vertically unstable and 5 patients with combined rotationally and vertically unstable fracture. In type B fracture, 30 patients were surgically approached anteriorly by pfennenstiel incision, while type C (15) patients required ilioinguinal extension to fix anterior and posterior ring. Combined unstable fracture in 5 patients require anterior and posterior approach as two stages surgical exposure with one week interval. It is concluded that anterior approach to displaced pelvic fracture was good and suitable for young and thin patients. In addition anterior ring fixation was the key for anatomical reduction of displaced fracture and horizontal application of small fragment implant across the sacroiliac joint and anterior ring could be achieved and maintain the stability if full weight bearing is delayed to 6 month. Other advantages and limitation of the procedure were discussed. This study designed to determine the surgical outcome of transcanalicular dacryocystorhinostomy for the treatment of blocked lacrimal pathway. This is a prospective study of 36 patients admitted in Basrah General Hospital from March 2008 to May 2010. The age of the patients was in range from 6 to 60yrs. Forty five (31.25%) were males and 99(68.75%) were females. All of these cases were unilateral. Thirty three (93.05%) of the total patients were operated general local anesthesia and the rest 3 (6.94%) were under local anesthesia. The overall success rate was 62.5% in non-intubated patients and 93.75% with intubation. It is concluded that Diode Laser Transcanalicular dacryocystorhinostomy is still a new surgical procedure for the treatment of nasolacrimal duct obstruction and need further refinement of the surgical procedure and studies for evaluation of effectiveness and success. The study is designed to evaluate the confidence, reliance and the degree of acceptance of laparoscopic surgical procedures among Mosul city population after 15 years of work in this field of surgery. This is a prospective data collection study. Participants were eight hundred persons, all of them from Mosul city with complete normal health at time of evaluation; all of them were above 18 years of age. The main outcome measures: The persons involved were divided into 4 groups according to their literate and educational level, each group composed of 200 persons, the first group (literate medical personnel) composed of medical doctors of various specialties, the second group (literate non medical personnel) composed of persons who were graduated from various colleges, apart from medical one. The third group (partially literate personnel) included those who did not complete the secondary school. the fourth group (low literate personnel) included those who did not completed the primary school. The questioners asked the following questions: 1- Did you know what laparoscopic surgery means? A special information score was used to evaluate the questioner knowledge. To those who answer yes for the first question and the information score was acceptable, the second question was: 2- Do you prefer this type of surgery to be used on you or on one of your first relative if feasible and needed? 3- If the answer for question 2 is yes, please tell us why. 4- If the answer for question 2 is no, please tell us why. The data were collected and comparison was done among the groups. All the medical persons were aware about laparoscopic surgery, 183 agreed to underwent such procedure if needed during the coming time, 160 of the second group knew what is laparoscopic surgery and 123 accepted to be used on them if needed, 118 of the third group knew what is laparoscopic surgery and 80 agreed to be used on them, while 85 of the fourth group had information about laparoscopic surgery but only 42 of them accepted it to be used on them if needed. Those who accepted laparoscopic surgery did so because they think that, it is more cosmetic, less painful and needs less hospitalization time, while those who refused it, did so because they afraid from dangerous instrument, the risk of complication and conversion. In conclusion, laparoscopic surgery is a well known surgical procedure among population in Mosul city, it gained acceptance and confidence especially in literate persons, but it needs more verification for low literate population. Cosmetic, less hospitalization and less post operative pain are the stocks for acceptance while complications, conversion and untrusting instrument and surgeon are the reasons for refusal of laparoscopic surgery. This is a study to review the local experience with the use of TPIPF in the repair of failed hypospadias in order to improve the results in the future. A total Number of 20 cases of failed Hypospadias was repaired during the period between 2001-2009 done in the public and private hospitals in Tikrit and Basrah. The repair was accomplished via Duckett method (transverse preputial island pedicle flap). The medical and operative records of each patient were registered and followed for 6 months. The success rate was 47% (9 patients). The complication rate was 55% in which urethro-cutaneous fistula was the commonest in 32% of the cases, meatal stenosis in 16%, urethral stricture in 10% and breakdown of the tube in 5%. In conclusion, TPIPF remains a viable option in the management of failed hypospadias especially in the proximal type, the complications can be avoided by using the magnification loupes with perfect surgical technique and mandatory proximal urinary diversion. Abstract This study aimed to evaluate the effect of preoperative single dose of Dexamethasone on postoperative morbidities in children undergoing tonsillectomy. This is a prospective study considering 90 children with chronic tonsillitis who underwent tonsillectomy between June 2010 and December 2010 at the Department of Otolaryngology in Al-Diwaniah Teaching Hospital in Al-Diwaniah city, Iraq. Compared with placebo, Dexamethasone group have lower percentage of post tonsillectomy morbidities (pain, postoperative nausea & vomiting and uvular edema) but without statistical significant. In conclusion, there is no statistical beneficial effect of preoperative dexamethasone on the postoperative morbidities in children undergoing tonsillectomy.